1) Preheat oven to 140°C. Also grease and line the bottom of an 8'' round pan. 2) Mix Portion A in a deep pot and bring to a boil over low heat until you get a smooth texture. 3) Cool the mixture until lukewarm and beat Portion B into the pot and mix well. 4) Fold in Portion C in 3 parts and mix until all combined. 5) Pour the batter into prepared pan and bake for 50mins to 1 hour until cooked. 6) Cool it in the pan on a wire rack till completely cool before frosting. 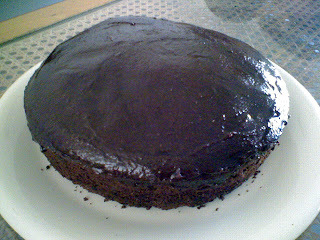 7) Mix Portion D until it reaches the consistency of spreading and frost it over the cake. Use 3/4 cup of cocoa powder instead of 1/2 cup if you want a richer frosting. However, mix in a little more milk to get the right texture to frost. 0 comments on "Very Moist Chocolate Cake with Rich Buttercream Frosting"